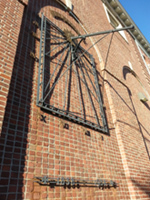 The dial is at Faunce Hall on the main green of the Brown University campus. It is on the south wall of the building above a sunken courtyard. There is a balcony on the wall from which the dial may be viewed up close. The dial was designed by Albert Harkness from drawings by Donald S. Reed. The astronomical calculations were made by Prof. Charles H. Smiley, director of the Ladd Observatory. The dial was a gift of the Beta Chapter of the Delta Phi Fraternity in 1938 to mark the Brown University chapter's centennial. A scroll above the dial bears the symbols of the major planets, from left to right: Mercury, Venus, Earth, Mars, Jupiter, Saturn, Uranus, Neptune, and Pluto. Below the dial are the centennial dates of the Delta Phi Fraternity: "1838- 1938"